Artisan baker Declan Ryan of Arbutus Bread, and winner of the first Michelin star in Ireland, talks to Caroline Hennessy for SilverCircle.ie about the resurgence of interest in good quality bread and his grandmother’s recipe for brown soda bread. First published in 2009. Head along to Middleton Farmers’ Market on a Saturday morning and you can’t miss the distinct Arbutus Bread smell. Follow your nose and you will find Declan Ryan’s stall, piled high with fragrant, just-baked brown soda cakes, white ducks, baguettes, wholemeal spelt loaves and sourdoughs. Ryan is always busy, meeting and greeting as he sells and charms, popping bread into bags and baskets or grabbing an empty flour sack to fill for the regulars who take six or seven loaves at a time. Surrounded by eager customers, his wares never last for long. Ryan used to make brown soda bread for his appreciative restaurant customers but, as they told him, “it was not ideal for mopping”. With James Beard’s definitive Beard on Bread to hand, he started experimenting with different yeast breads. The day after he retired from Arbutus Lodge in 1999, he started baking in his garage. However, demand was such that he swiftly outgrew those temporary premises and now the night’s baking is done at a well-equipped industrial unit. Ryan’s one-time hobby has grown into a full-time business, employing eight people, including five bakers, supplying high quality, hand-finished breads to restaurants and delis in and around Cork city. In a country with few artisan bread makers and a new-found hunger for real bread, Ryan’s second career has turned into a runaway success. As yet, only nine years into his (first) retirement, he shows no signs of slowing down. With people willing to travel from far and wide to get their hands on Arbutus Bread, long may Ryan’s bread-making passion continue. Preheat the oven to 230ºC/210ºC fan oven/450ºF/gas 8. Sieve the plain white flour, salt, bread soda and cream of tartar into a large bowl. Add the coarse brown flour and Macroom oatmeal and mix well. Whisk the sour cream and sunflower oil with 600ml of the buttermilk. Make a well in the centre of the dry ingredients and pour in most of the liquid. Using a wooden spoon (or your hand), stir the ingredients together, adding more buttermilk as necessary to produce quite a wet dough. Roll in the extra coarse brown flour and shape into a cake. Cut a deep cross on the top and bake in the preheated oven for 15-20 minutes before reducing the heat to 200ºC/190ºC fan oven/400ºF/gas 6. Bake for a further 20-25 minutes. The bread should be well risen, brown, crusty on top and there should be a hollow sound when you tap the base of the loaf. Turn out on a wire rack and wrap in a clean tea towel until cold. 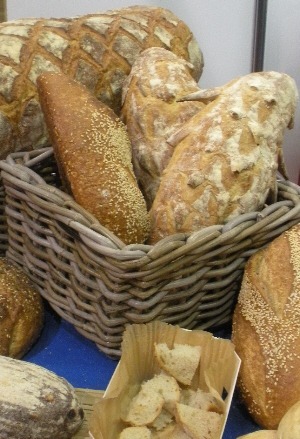 Arbutus Bread, Unit 2B, Mayfield Industrial Estate, Mayfield, Cork.